The Porsche LMP Team has kicked off the race weekend with best times in Mexico City, where on Sunday the fifth round of the FIA World Endurance Championship (WEC) is going to take place. On Friday the two Porsche 919 Hybrids were the fastest cars on the 4.304 kilometre long Grand Prix circuit at the million-resident metropolis. After heavy rain over the recent days, the first practice session on the famous Autódromo Hermanos Rodríguez was held on a wet and then drying track early Friday evening. The 919 with car number 1 in the hands of world champion Neel Jani (CH), André Lotterer (DE) and Nick Tandy (GB) topped the time sheets with Lotterer’s best lap of 1:27.026 minutes. Earl Bamber (NZ), Timo Bernhard (DE) and Brendon Hartley (NZ) followed with a lap in 1:27.675 minutes with the sister car. The second and third free practice sessions as well as qualifying – 18:20 until 18:40 hrs local time – will be held on Saturday. The six-hour race will start on Sunday at noon. The weather forecast is highly unpredictable. 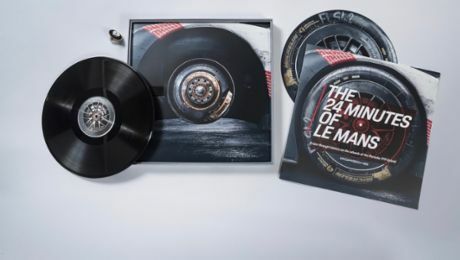 In 2017, the Porsche LMP Team achieved a third consecutive Le Mans overall victory, won the six-hour race at the Nürburgring and now aims to also win the manufacturers’ and drivers’ world championships for the third time in a row. After the summer break the Porsche LMP Team heads to the first 2017 overseas race: The team aims to extend its championship lead in Mexico City. After race wins in Le Mans and at the Nürburgring, Porsche now leads the manufacturers’ standings on 154 points from Toyota (114.5 points). The trio of Earl Bamber (NZ), Timo Bernhard (DE) and Brendon Hartley (NZ) currently tops the drivers’ standings on 108 points, having a 30-point advantage to the best placed Toyota crew. Reigning World Champion Neel Jani (CH) and his partners André Lotterer (DE) and Nick Tandy (GB) with the second Porsche 919 Hybrid currently rank in fourth position (46 points). Fritz Enzinger, Vice President LMP1, says in the run-up to the six-hour race in Mexico: “We continue to follow the clear target of defending both world championship titles. 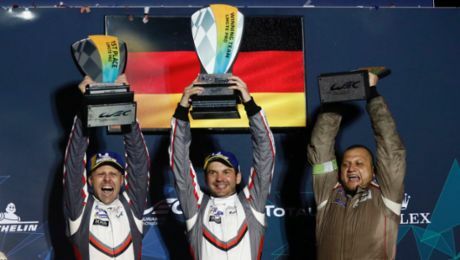 After winning the Le Mans 24 Hours for the third consecutive time despite difficult circumstances, and more recently claiming a hattrick of wins at the Nürburgring, we want to conclude the 2017 WEC with the third successive constructors’ and drivers’ titles.” Since Porsche’s return to the top category of Le Mans Prototypes (LMP1) in 2014, the Porsche 919 Hybrid has won 15 races. Driver's quotes in the press release (see downloads). In the 2016 qualifying, the lap times of the top four LMP1 cars were covered by just three tenths of a second. The two Porsche 919 Hybrids started from grid position two (Romain Dumas/Neel Jani/Marc Lieb) and four (Timo Bernhard/Brendon Hartley/Mark Webber). Pole position went to Audi drivers Lucas Di Grassi/Loic Duval/Oliver Jarvis with an average lap time of 1:25.069 minutes. They had beaten the average time of the second placed Porsche by a mere 0.042 seconds. André Lotterer, back then at the wheel of the sister Audi, managed the overall fastest qualifying lap in 1:24.763 minutes. The action packed six-hour race saw frequent changes for the lead, rain at times and Bernhard/Hartley/Webber taking the race win. The sister Porsche was unlucky with the tyre strategy in changing conditions and also had contact with another car. The 2016 world champions finished fourth in Mexico. The Porsche GT Team fields two new 911 RSR in the GTE-Pro class on the racetrack at the Autódromo Hermanos Rodríguez at an elevation of 2,310 metres. The 911 RSR racer celebrated its maiden victory on July 22, 2017, at the American IMSA SportsCar Championship race in Lime Rock. This is the second time that Mexico has hosted a WEC round. Like at the 2016 premiere, fans can again look forward to a gripping race with fierce duelling, particularly in the GT-Pro class. The Balance of Performance, which was created to ensure that all vehicles of different concepts compete on the same performance level, has been readjusted for this race. Next up after Mexico are the WEC rounds in the USA, Japan, China and Bahrain. Four works drivers and a Porsche Young Professional compete for the Porsche GT Team: Richard Lietz (Austria) and Frédéric Makowiecki (France) share the cockpit of the #91 Porsche 911 RSR in the GTE-Pro class. They kicked off the season with third place at Silverstone and clinched second recently on the Nürburgring. Their team colleagues Michael Christensen (Denmark) and Kévin Estre (France), who finished third at the Nürburgring, man the #92 car. 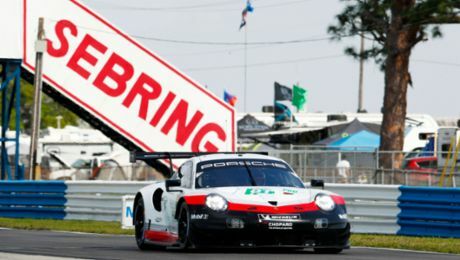 In the GTE-Am class, the Porsche customer squad Dempsey Proton Racing fields a 911 RSR from the 2015 model year. The drivers of the #77 vehicle are the Porsche Young Professional Matteo Cairoli (Italy) as well as Christian Ried and Marvin Dienst from Germany. So far this season, they have achieved a victory at the Nürburgring, third place at Silverstone and second in Spa-Francorchamps. The Porsche 919 Hybrid develops a system power of around 900 HP (662 kW) that comes from a compact two-litre turbo charged V4-cylinder (nearly 500 PS/368 kW) engine and two different energy recovery systems – brake energy from the front axle combined with exhaust energy. The combustion engine drives the rear axle while the electro motor boosts the front axle with an output of more than 400 PS (294 kW). The electrical energy that comes from the front brakes and the exhaust system is temporarily stored in a liquid-cooled lithium ion battery. Porsche Motorsport at Weissach designed the Porsche 911 RSR from scratch for this season, based on the high-performance 911 GT3 RS sports car (Fuel consumption combined 12.7 l/100 km; urban 19.2 l/100 km; extra urban 8.9 l/100km; CO2 emissions 296 g/km; efficiency class (Germany): G). Depending on the size of the restrictor, the motor, which is now positioned in front of the rear axle, puts out around 375 kW (510 hp). Thanks to the particularly large rear diffuser combined with a top-mounted rear wing, the level of downforce and the aerodynamic efficiency were significantly improved. The 911 RSR made a successful start to the WEC season, clinching third at its maiden outing in Silverstone. On the Nürburgring recently, it scored a double podium result with second and third place. The “Balance of Performance” applies to the GTE-Pro class of the WEC Sports Car World Endurance Championship. “BoP” was introduced by the FIA with the aim of achieving a level playing field for the different vehicle concepts, and thus ensuring balanced and fair races. The intention is that it should not make a fundamental difference if a vehicle is powered by a turbocharged or normally aspirated engine, or if the engine is mounted on the front axle or in front of the rear axle. The basic aerodynamic shape of the vehicles should also not play a decisive role. After an initial grading by the FIA, the balance of performance is adjusted at the races by means of telemetry - not only using lap times, but also acceleration profiles and engine mappings. This data input is analysed and automatically incorporated into the “Balance of Performance”. The most frequently used means of adjusting the performance level is through adding or subtracting weight. In keeping with the rule-makers’ intention, the key to success on the racetrack is not about the individual potential of a vehicle, instead it’s about the performance of the drivers, the race strategy, a perfect setup or the skill of the team with their pit stops. With the Autódromo Hermanos Rodríguez, Mexico has paid tribute to its racing legends Pedro and Rícardo Rodriguez. The 4.421-kilometre racetrack with its 17 corners can look back on an eventful past. Since Jim Clark won the Formula 1 race there in 1963, the circuit has been closed on and off for renovations and then reopened. The corner combination at the end of the back straight is exceptional: It runs through the Foro Sol, a former baseball stadium that can seat 26,000 spectators. The six-hour race in Mexico City starts on Sunday, 3 September, at midday local time (19.00 hrs CEST). The TV channel Sport 1 broadcasts the start preparations and the podium ceremony live from 18.30 to 01.20 hrs. The race can also be viewed free-of-charge via live streaming from 14.00 to 21.00 hrs on Sport1.de. On pay-TV, the race can be watched from 18.45 to 01.15 on Motorsport.TV. The FIA WEC app is free in its basic version, and offers live streaming of the complete race as well as the time-keeping for a fee. Eurosport telecasts the race highlights on Monday, 4 September, from 11.30 to 12.30 hours. The WEC efficiency regulations limit the amount of energy that can be used per lap. On the 4.304 kilometres long lap of the Autódromo Hermanos Rodríguez, the Porsche 919 Hybrid can use 3.92 megajoule of electrical power from energy recovery systems and 1.10 kg/1.52 litres of petrol. At normal race speed, the Porsche 919 Hybrid is due for refuelling after a maximum of 40 laps. Refuelling and changing tyres may only be done sequentially, not at the same time. Only four mechanics may work simultaneously when changing tyres and also may use only one wheel gun at a time. That takes a lot longer than in F1, for example. The drivers are normally only changed when new tyres are needed. These different types of tyres can be used: three different compounds of slick tyres for dry conditions, a hybrid tyre (no profile either but softer cover) for mixed conditions and wet weather tyres. Four sets of dry weather tyres are available per car for qualifying and the race, this is two sets less than in 2016. A lap on the Grand Prix circuit has eleven right handers and six left handers. Sports prototypes and GT vehicles contest the Sports Car World Endurance Championship (WEC) in four classes: LMP1 (eg. Porsche 919 Hybrid), LMP2, LMGTE-Pro (eg. 911 RSR) and LMGTE-Am (eg. 911 RSR model year 2015). They all compete together in one race but are classified separately. At Le Mans, double points are awarded in all classes towards the championship.